Who said organizing emails in your Gmail inbox has to be a boring, mind numbing affair? 0Boxer aims at making the mundane email tasks such as reading, deleting, organizing, tagging your Gmail emails a fun task. Once granted access to your Gmail account with oAuth, 0Boxer web app monitors your Gmail account for activity. You will also need 0Boxer’s Chrome or Safari extension installed. You will see a new pink bar at the top of your Gmail screen and you score by organizing mail in your Gmail. 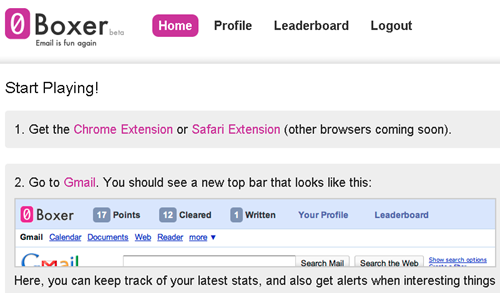 The site gives you scores like organizing Gmail is a game and even has a leaderboard that shows weekly and daily top 0Boxer users. As you aspire to become a top 0Boxer user, the good email habits will also result in a cleaner and more organized inbox that we all can badly use. You also get badges as you hit milestones with 0Boxer.